Taking an i30 as the test mule, Hyundai has revealed its virtual cockpit study, which it claims can be customised as per the driver's needs. In keeping with the latest trend of replacing conventional switches and buttons with touch-surface counterparts, Hyundai has started working on revamping its future cockpit designs, taking the 'virtual' route. By tracing the evolution of its cockpit and steering wheel designs since 2015, Hyundai was able to demarcate four significant phases during the entire process, each one corresponding to some crucial design change. In 2015, the brand took notice of the fact that there was a growing need to reduce the number of buttons in the cockpit in order to achieve a cleaner look. Thus, the rocker switches were replaced by two touch panels. 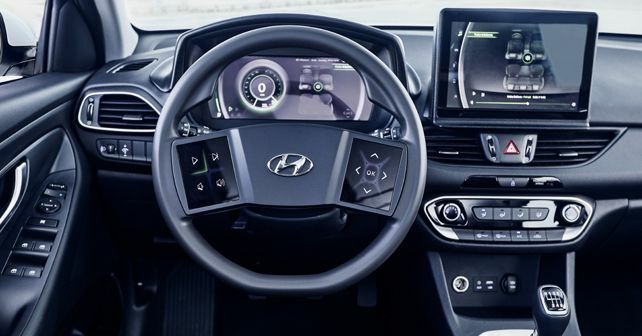 By 2016, all hard keys were replaced by touchpads and finally, in 2018, Hyundai brought along touch displays with haptic feedback on the steering wheel. As the i30 offers the brand's latest innovations, Hyundai chose to use it as the demo vehicle for its virtual cockpit study. As seen in the image, the two displays present on the steering wheel have increased in size and their function can be programmed as per the driver's requirement. To make haptic feedback possible, Hyundai has added two actuator modules underneath the surface of the displays. Even the centre-display has been optimised by the addition of the newly-developed haptic modules. In its latest virtual cockpit development, Hyundai has updated the regular instrument cluster display with a multi-layer display (MLD) unit. Compared to conventional displays, the MLD unit features two displays stacked behind each other with a 6mm gap. This allows for a 3D visual effect, as one part of the graphic is shown on the front display and the other part on the rear display. In the area where the graphics overlap, the impression of an object in space is created. This technology, Hyundai claims, provides information to the driver with less distraction. Much like the customisable display of a smartphone, the driver can also alter the layout of the haptic touchscreens on the steering wheel by adding up to five buttons per display, as per their preference and usage frequency. Further, the pieces of information indicated on the steering wheel displays change depending on the current instrument cluster menu level and also depending on the driving situation. While Hyundai claims that being able to fit a prototype concept into a production vehicle is in itself a big step, the virtual cockpit is still in its early development stage, and at this point, we have no clear information about its commercial debut. However, it’s certain that after its debut, Hyundai will work on offering it in as many of its models as possible.